Have you ever seen a rat inside of a snake’s body and wondered how it is ultimately digested? Students have probably seen this image and thought it was SO COOL! Are there certain things that we as humans put into our bodies that take as much effort to transform into energy? This fascinating video excerpt from NOVA scienceNOW — with many support and extended learning materials — addresses these questions and more about the potential energy contained in food. Correspondent and New York Times technology columnist David Pogue explores how a rat is digested by a snake and how food fuels the body, while scientist Stephen Secor demonstrates how to measure the amount of energy stored in a food using a bomb calorimeter. 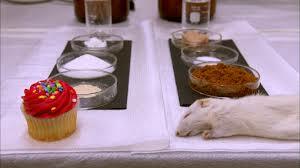 Portions of a dehydrated cupcake and rat are burned in a special tank to reveal which contains more calories: the cupcake or the rat? You and your class won’t believe the answer in Food Is Fuel for grades 6-12. This entry was posted in PBS Resources, Teaching Tools and tagged pbs learningmedia, science, video. Bookmark the permalink.